We’ve all been in the situation before. A dusty, ancient bottle of Bordeaux is brought out by the sommelier or served by a friend at a holiday feast. Its label, which has gradually faded and began to peel off its glass canvas, elicits shock and reverence from our dinner companions. We scan for logo, producer name, cru classification and vintage to know just how shocked and amazed we ought to be. And then the experience begins – how to open without breaking the cork, how to decant for sediment without oxidizing the fragile wine. But what do we really know about the contents of these highly valued bottles? 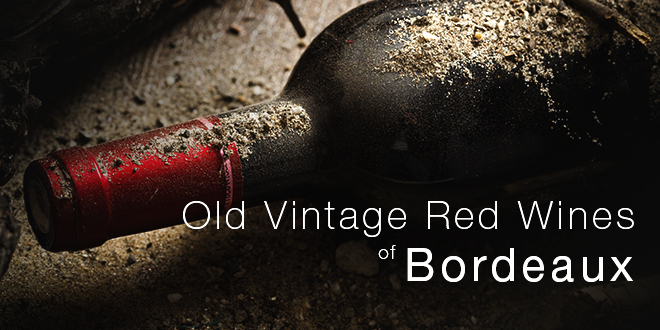 Let’s take a closer look at the old vintage reds of Bordeaux, recently awoken from their peaceful years of slumber. What counts as an “old” vintage? And what is now just vinegar? For the sake of this article, let’s use the term “old vintage” to refer to any wine aged in bottle for over 15 years. As any living thing, wine evolves through time and its life cycle can be categorized into four different stages: youth, maturity, climax and decline. You have most likely already heard a wine being described as “having good ageing/cellaring potential.” This usually means that certain characteristics of a wine (grape varietal, origin, geographical origin, chemical composition) forecast an improvement over time stored in the bottle. Popular varietals for ageing include Cabernet Sauvignon and Nebbiolo. Bordeaux Blends – made up of Cabernet Sauvignon, Cabernet Franc and Merlot – are known for ageing particularly well. Generally wines with more tannins and higher acidity tend to age better, since an abundance of these components offers the ageing process “more to work with.” This also means that wines which are meant to be aged are often too dry, bitter and acidic to enjoy to the fullest in their youth. Let’s take a classic Bordeaux Left Bank red wine, a Medoc of 2016 and one with 10 years of age, as an example. In its youth, this wine is harsh, leaving the mouth dry and raspy. But with age, the same wine becomes a veritable nectar, unctuous, elegant and round in the mouth. Its tannins have melted over time to offer a smoother structure. The correct way to store a wine to be aged is on its side in a dark place, at a temperature between 7 and 18° C and a humidity between 50-70%. The wrong storage conditions may result in the cork drying out, which can lead to oxidation of the wine. Too many UV rays can also cause the wine to degrade. In either case, the wine will brown and become acidic, tasting of vinegar and stinging the nose. However, if stored correctly, the wine has a chance to reach that beautiful plateau of its quality where the tannins have softened, its fruity flavors caramelized and its tertiary aromas of game, mushroom and forest floor allowed to reveal themselves. When this happens and the wine still maintains a certain freshness, fruit and spice, it is said to have reached its climax. At this stage, a big red Bordeaux – for example – will offer a richness, smoothness and creaminess, the hallmark characteristics of the proverbial “old wine.” But alas, all good things come to an end, and this unfortunately holds true for wine as well. The climax phase is followed by a gradual decline, as wine eventually oxidizes and loses its “spirit” over time. 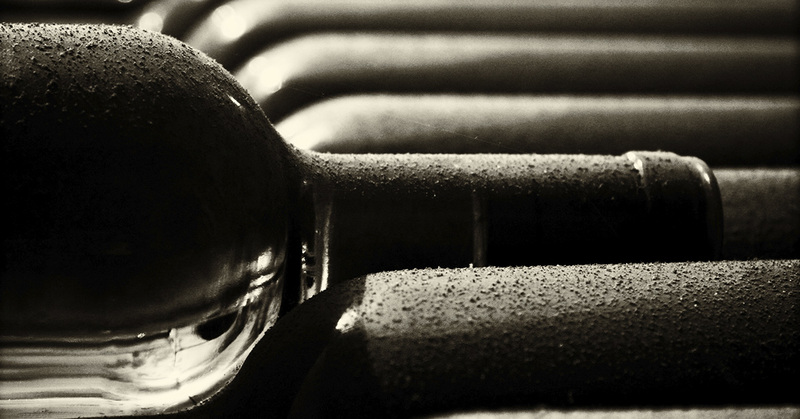 Collectors are often faced with the temptation to store their ancient vintages forever. But once a wine has passed its climax, the chance of it tasting the way it’s supposed to diminishes exponentially. Our advice? Keep as long as recommended and open for a special occasion! Better yet – create a special occasion to celebrate its opening! So what does all this mean for that bottle of stunning old Bordeaux glowing on the table in front of us? Let’s begin with the vintage considered the best in the region’s history, the legendary 1947. In this year, the summer was hot and dry, with the harvest starting around 10 days earlier than usual at most Bordeaux chateaux. The grapes reached an exquisite level of ripeness and concentration, a perfect balance of ripe fruits with alcohol and residual sugar. And how can we resist mentioning the 1949, truly one of the greatest post-war vintages Bordeaux has ever produced? Or 1893, a year which brought the highest temperatures logged in Bordeaux wine history. These wines are extremely rare today and what’s left of them is locked away in the cellars of collectors who seek to hold on to them just a bit longer. Some of the more recent but equally legendary wines include the mythical Petrus 1982, an exceptional vintage – both in terms of quantity and quality – that marked also the birth of a new style in Bordeaux. This wine reflects the growing influence of French oenologist Michel Rolland and the most important of critics, Robert Parker. Bottles from vintages 1995, 1996 and 2000 will likewise remain a source of great excitement for wine lovers lucky enough to get their hands on them. And, although still in need of several more years of careful ageing, the 2005 vintage has recently joined the realm of exceptional vintages. The growing season was marked by ideal climatic conditions, starting in May with seemingly constant sunshine, not too much heat, and cool nights to allow for a slow and healthy ripening of the grapes. As we have seen, there are several benefits to enjoying an old vintage of Bordeaux red wine. An old wine carries with it a certain mystique and charm, as it embodies the conditions of a great vintage trapped inside a bottle. There is nothing quite like tasting a wine produced in one’s birth year on a special occasion, or celebrating an important anniversary with a bottle from a precious date. Nevertheless, serving an older bottle presents a certain set of challenges, along which the two most notable are the cork and the sediment. Assuming that the wine was stored under the right conditions without any cork damage, the bottle should be opened carefully to avoid the cork breaking. This can be done with a twin-prong cork puller or a Durand opener, designed to safely extract older corks. Older vintage Bordeaux wines also tend to have quite a bit of sediment at the bottom of the bottle, which can be removed through a fine mesh strainer but is more easily poured off its dregs. While using a decanter runs the risk of oxidizing fragile old wines, like those of Burgundy, old vintage Bordeaux blends actually benefit from limited exposure to oxygen before tasting. Pour the wine from the bottle at a 45° angle, stopping when the sediment begins to move toward the neck of the bottle. For more tips on how to properly open an old vintage Bordeaux, take a look at our Millesima Tips article on the subject. And when it comes to food pairing, we suggest serving these elegant wines with a dish worthy of their nobility and richesse. The perfect food pairing will be tasty but not too heavily seasoned, in order not to mask the subtle flavors of the wine. Choose something that will, instead, highlight the complexity of these old vintages. Good candidates include roasted red meats dressed in light sauces and risotto graced with truffles for the mighty crus of Bordeaux’s prestigious Left Bank. Think veal sweetbreads and decadent pan-seared foie gras with the Merlot and Cabernet Franc dominated blends of the Right Bank. And when it comes to choosing the right cheese, think round and sweet, like a Saint-Nectaire. Ready to experiment with old vintage Bordeaux? Experience the majesty of a Pauillac Chateau Latour 1998 or the sheer wonder trapped inside a bottle of Chateau Haut-Brion 2000. In the case of Bordeaux’s prestigious chateaux, the proverb rings true. Old wines, like friends, are indeed better with age.